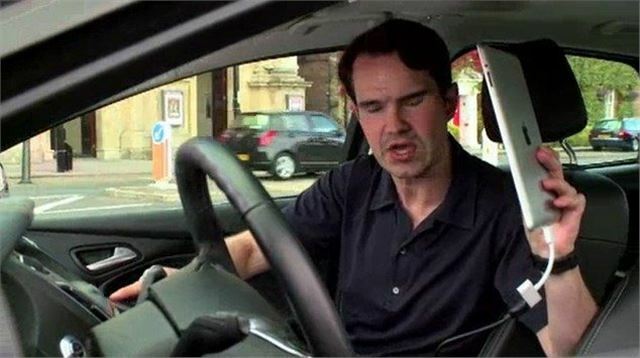 Comedy stars Jimmy Carr and Jay Leno have been brought together for a unqiue gig to showcase Ford SYNC technology, as part of the Ford of Britain Centenary Tour. Although Jimmy and Jay were 6000 miles apart, they were brought together from the front seats of two Focuses using Ford’s Wi-Fi-enabled SYNC system. It uses an external USB broadband modem, plugged into the vehicle’s media system, effectively turning it into a rolling Wi-Fi hot spot. By broadcasting a secure wireless connection throughout the vehicle, Ford SYNC allows up to 5 passengers with Wi-Fi-enabled mobile devices to access the signal. Carr and Leno used this signal to run Skype on their iPad 2’s, allowing them to video-call each other from across the Atlantic.